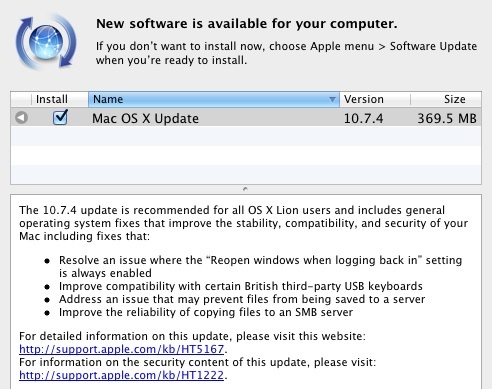 Apple today released OS X 10.7.4, the fourth maintenance update to OS X Lion. The update is currently available via Software Update and should appear on Apple's download pages soon. Detailed information is available in the full release notes. Notably, the update also includes a fix for the password security hole detailed earlier this week. An issue existed in the handling of network account logins. The login process recorded sensitive information in the system log, where other users of the system could read it. The sensitive information may persist in saved logs after installation of this update. See http://support.apple.com/kb/TS4272 for more information about how to securely remove any remaining records. This issue only affects systems running OS X Lion v10.7.3 with users of Legacy File Vault and/or networked home directories. Apple has separately pushed out a Safari 5.1.7 update containing several improvements including disabling out-of-date versions of Adobe Flash Player for security reasons. Out-of-date versions of Adobe Flash Player do not include the latest security updates and will be disabled to help keep your Mac secure. If Safari 5.1.7 detects an out-of-date version of Flash Player on your system, you will see a dialog informing you that Flash Player has been disabled. The dialog provides the option to go directly to Adobe's website, where you can download and install an updated version of Flash Player. Finally, Apple has also released Apple Remote Desktop 3.5.3 Client (3.80 MB) to address general compatibility issues. Thank God they fixed the "Reopen windows" checkbox! This patch improved my computer performance by 17%! That first fix has been a long time coming! Second. I HATE that "feature". I hate it on the iPhone too. When I restart I want a fresh start. I'm "super excited and really thrilled" about this update. Such killer features as unchecking a box to open all apps on login are the ones that make me go to work every day. But it will always be ugly to look at. I honestly hope they've fixed that bug where your apps will automatically re-organise themselves in launchpad each time you shut down your mac. I'm sick and tired of re-organising them each time I log in. Glad to hear that the checkbox for re-opening windows won't be highlighted, although I wasn't even aware it was a bug, I just thought it was an annoying feature.